Dr. Adekunle Adeyeye is a Professor of Electrical & Computer Engineering at the National University of Singapore. He is a Fellow of the Institute of Physics, Fellow of the Institute of Nanotechnology and Senior Member of the Institute of Electrical and Electronic Engineering. He is one of the principal investigators at the Information Storage Materials Lab. He is also a Fellow of the Singapore-MIT Alliance (SMA), Advanced Materials for Micro & Nano Systems. He has won many awards and was named one of the top 100 young innovators in the world by TR100, an award winning MIT magazine on technology. He was a winner of the 2004 NUS Young Researcher Award. Dr. Adeyeye graduated with a First Class Honors from the University of IIorin, Nigeria in 1990. He obtained his MPhil in Microelectronics Engineering and Semiconductor Physics and PhD at the Cavendish Laboratory, University of Cambridge in 1993 and 1996 respectively. He was elected a Research Fellow at Trinity College, University of Cambridge in 1996. He then worked as a Senior Research Engineer at the Data Storage Institute, Singapore in 1997, before returning to Cambridge to take up his fellowship at the Nanoscale Science Laboratory. 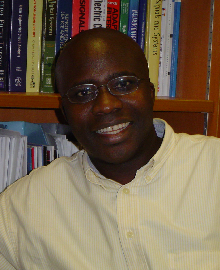 Dr. Adeyeye joined the National University of Singapore as an Assistant Professor in Electrical and Computer Engineering in May 2000 and was promoted to Associate Professor with Tenure in January 2006. In July 2012, Dr. Adeyeye was promoted to a Full Professor in Electrical and Computer Engineering, NUS. In January 2013, Dr. Adeyeye was named one of the distinguished lecturer by IEEE Magnetics Society. Dr. Adekunle's research focuses on the fundamental understanding and exploration of magnetic nanostructures in applications such as ultra high density storage, magnetic random access memory (MRAM) and spin logic. We are developing new functional nanomaterials such as multiferroic and half metals nanostructures for spintronic applications and ultra high sensitive biosensors. He has co-authored more than 150 papers in international refereed journals.